“Only purchase equipment that will be used on a regular basis. If a monthly trip to the local copy service is all that’s necessary for color copies, investing in a color machine is frivolous“. Working from home has many advantages, such as reduced costs, better work-life balance and increased productivity. 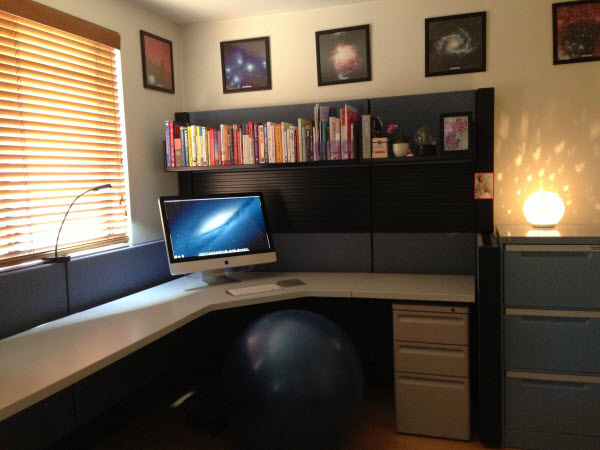 One way to further improve productivity is to design an ideal home office—one you love being in. To start, you’ll need to take a number of aspects into consideration, as outlined by ClickMeeting blogger Agnes Jozwiak. Are you going to be video conferencing? How about receiving visitors? Will you have a partner or intern working with you in your space? It’s a lot to plan for. What else do you need for a productive home office? Only purchase equipment that will be used on a regular basis. If a monthly trip to the local copy service is all that’s necessary for color copies, investing in a color machine is frivolous. Video conferencing technology is likely essential as well—especially for B2B professionals who require frequent meetings and conversations with clients. In some cases, clients and associates may want to meet in person. In such cases, equipment and furniture should appear clean and professional. Remember ergonomics when selecting much of the equipment, because this directly relates to health and well-being. Chair manufacturers have researched the biomechanics of seating, for instance. Some options feature free shoulder and pelvis balance point technology. Also consider comfortable mouse instruments, keyboard pads and foot rests. The objective of these items is to make you as comfortable as possible. Adequate lighting is vital to productivity. Ideally, there will be as much natural light as possible—daylight is the most balanced source of white light there is, meaning it has a nearly equal proportion of each color on the spectrum. If this isn’t possible, a combination of task and general lighting will be necessary. Task lights are essential for cloudy days and late nights. Daylight-replicating options are also available to provide energy-efficient, full-spectrum light. Dimmers are useful as well, because one of the most crucial factors to good lighting is the ability to control its intensity and brightness. The most effective lighting reflects the highest quality of colors illuminated. Yellow-case illumination seems to be most comfortable for individuals working from home. Gunnar Optiks makes specialized glasses for this purpose. From a home office, it’s helpful to avoid glare by not placing light sources directly above computer monitors. Similarly, refrain from placing a screen directly in front of light, as it will lead to eyestrain. Minimal distraction leads to maximum productivity. Obviously, a private office is optimal, but it is unfortunately not always an option. Headphones are useful for focusing, but they should not be necessary. To compensate, implement some white noise, such as a fan or an air filter. Because the desk is likely to be the place where the most work gets accomplished, it should facilitate the process. Consider options for organizing papers to ensure pending work is in a predetermined order to prevent the chaos that results from random piles. Think trays, pencil cups, memo holders, bulletin boards and more. Create comfort. The desk may be the primary focus of a home office, but it’s not the only element. It’s nice to have a place to relax while reading—or simply thinking—as well. Add a cushioned chair and ottoman, along with a lamp and coffee table. Consider adding some plants to improve mood and air quality. Scientific research suggests that greenery contributes to satisfaction. They are relatively low-maintenance, and can help filter the air. The psychology of color is also worth considering. Certain colors elicit particular physical and emotional responses, such as mood and energy level. It’s important to design carefully. For instance, blues, violets and greens lend to feelings of peace and relaxation. Yellow catches attention, which is why it’s the color of most highlighters. It can evoke optimism, but too much of it while working can also be overwhelming. Red is vibrant and tends to produce strong feelings. While this can be helpful in a workspace, it is best when used as an accent only. Ultimately, there is no definitive formula for color association. It’s your office; whatever is most pleasing to you is your best bet. ← Should You Really Quit Your Job to Start a Business?